How to preview the created slideshows on iPad and HDTV? After you have created a slide show with Photo Slideshow Director HD on iPad, you can preview it in two ways – directly on iPad, or on big screen HDTV. This article will illustrate you how. You can view it directly on iPad by tapping the button below the viewer. Tap the tap the button to pause. Make some slight changes if necessary. Then continue to play from the paused place. To preview the slide show in full screen: tap the button below the viewer. Tap the screen to make the task bar appear. Tap this button again to quit the full-screen mode. 1. Make sure your TV and iPad are both powered on. 2. Choose “HDTV” as the output format by tapping the button below the viewer. Posted in User Guide - Photo Slideshow Director HD	| Tagged hd slide show, HD video, ipad photo slideshow, loop, photo and video, photo slideshow, photo to video, repeat display, slide show, Slideshow, slideshow app, slideshow creator, slideshow display, slideshow ipad, slideshow maker, slideshow video, transition effects, transition time, video maker	| Comments Off on How to preview the created slideshows on iPad and HDTV? How to set transition and display time for your slide show? This user guide will tell you how to reset the transition time and display time for your slide show projects created with Photo Slideshow Director HD on iPad. Tap the “Edit” button in the upper-right corner above the app interface. Drag the slide of “Show Time” to set the display time for each slide in the slideshow project. Drag the slide of “Show Time” in the image shown above to reset the transition time for the slide show project. If you need the slide show to be displayed repeately, please turn on the “Repeat at end” button to let the slideshow loop. 1. 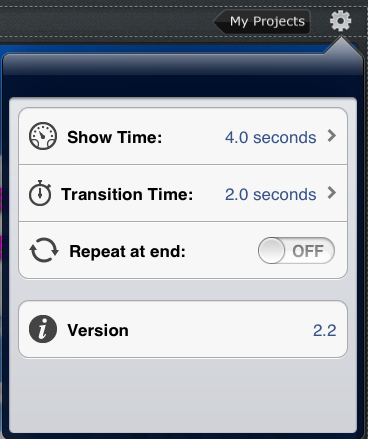 Default values for show time and transition time are 4 and 2 seconds. You can reset the value between 1.0 – 10.9 seconds in line with your needs. 2. The version info can also be seen here. Posted in User Guide - Photo Slideshow Director HD	| Tagged hd slide show, HD video, ipad photo slideshow, loop, photo and video, photo slideshow, photo to video, repeat display, slide show, Slideshow, slideshow app, slideshow creator, slideshow display, slideshow ipad, slideshow maker, slideshow video, transition effects, transition time, video maker	| Comments Off on How to set transition and display time for your slide show? How to customize transition effects for your slide show project? 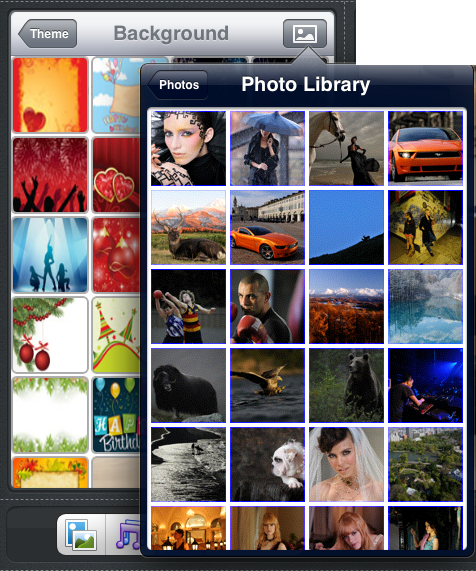 In Photo Slideshow Director HD for iPad, the transition effect will be randomly applied to each slide by default. However, you are able to customize it your own way if you don´t like the preset transition effects. 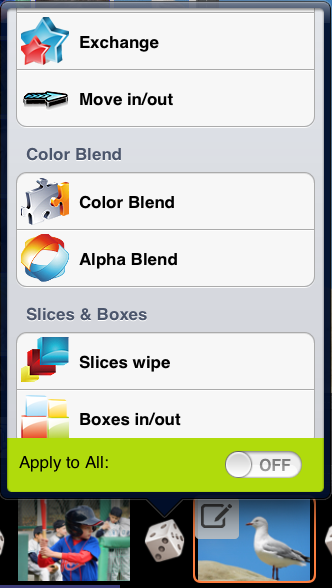 Change the transition: In the project timeline, tap the icon and the transitions list pops up. Tap one to select it as the current transition. Note: You can apply one transition effect for the whole slide show by turning on the “Apply to All” button. Posted in User Guide - Photo Slideshow Director HD	| Tagged ipad hd slideshow, iPad slideshow app, photo slideshow, photo slideshow director, photo slideshow iPad app, slide show, Slideshow, slideshow ipad, slideshow maker, slideshow program	| Comments Off on How to customize transition effects for your slide show project? How to choose theme for your slide show project? This user guide tells you how to add a proper theme to your slide show project on iPad, with Photo Slideshow Director HD. 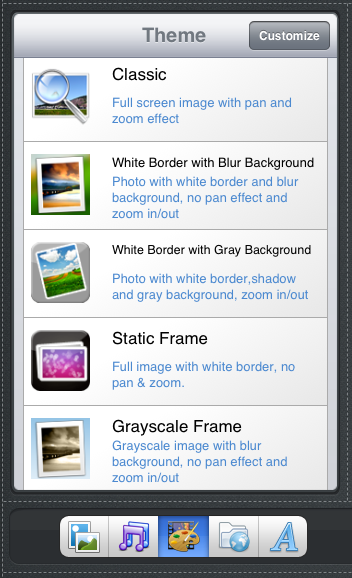 If not satisfied with the preset ones, you can upload your own images and set them as the theme. Tap the button to go to the themes list. Tap a theme to apply it to the slideshow. From the theme list, tap another theme and it will be applied to the slideshow. Not happy with any of the preset themes? No problem. Tap the “Customize” button on the top right of the “Theme” list and you can choose and add your own image as the slide show theme. Posted in User Guide - Photo Slideshow Director HD	| Tagged ipad hd slideshow, iPad slideshow app, photo slideshow, photo slideshow director, photo slideshow iPad app, slide show, Slideshow, slideshow ipad, slideshow maker, slideshow program	| Comments Off on How to choose theme for your slide show project? How to add background music to the slide show project on iPad? This article will show you how to enhance your slideshow by adding background music. With Photo Slideshow Director HD on your ipad, you are able to add music to your slide show projects, and you can hear it, move it and delete it. Tap the button to go to the iPad music collections. 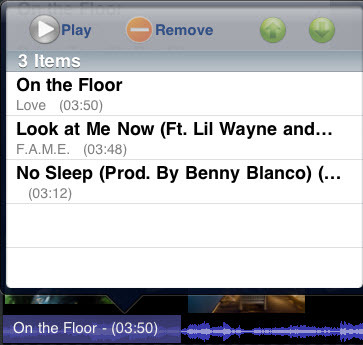 Tap a song to add it to the project. Then the song will appear in the project timeline. Note: You can add more than one song to the project. In the project timeline, tap the song and the music playlist pops up. Tap the song and then tap the Play button to play it. In the project timeline, tap the song and the music playlist pops up. Tap the song and then tap the Up and Down arrows to rearrange it. In the project timeline, tap the song and the music playlist pops up. Tap the song and then tap the Remove button to delete it. Posted in User Guide - Photo Slideshow Director HD	| Tagged ipad hd slideshow, iPad slideshow app, photo slideshow, photo slideshow director, photo slideshow iPad app, slide show, Slideshow, slideshow ipad, slideshow maker, slideshow program	| Comments Off on How to add background music to the slide show project on iPad? 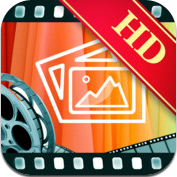 This user guide tells you how to add photos to the slide show project of Photo Slideshow Director HD on iPad, and how to delete, rearrange and edit them by adding subtitles and blank images. Tap the button to go to the iPad photo album. Tap the photo to add it to the project timeline. In the project timeline, touch and hold the photo until it pops off the timeline, then drag it to the viewer to delete it. 1.In the project timeline, touch and hold the photo until it pops off the timeline, then drag it back and forth and drop it. In the project timeline, tap the photo and the “Photo Text” dialog pops up. Tap the input area and the keyboard appears. 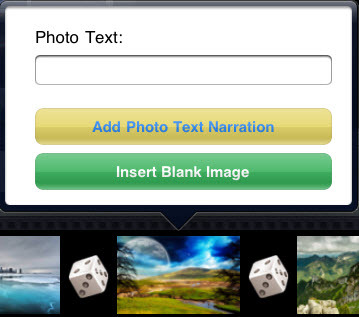 Type text and tap the Add Photo Text Narration button. In the project timeline, tap the photo and the “Photo Text” dialog pops up. Tap the input area and the keyboard appears. Type text and tap the Insert Blank Image button. Note: The blank image will be inserted in front of the photo. Posted in User Guide - Photo Slideshow Director HD	| Tagged create slideshow, photo and video, photo slideshow, slide show maker, slideshow creator, slideshow ipad, slideshow maker, slideshow video	| Comments Off on How to create a new slide show project on Photo Slideshow Director? Es fühlt sich gemütlich und unterhaltsam, wenn man DVD-Filme auf der Großleinwand des HDTVs zu Hause anschaut. Daher sind wir auf diese Idee gekommen, digitale Fotos auch auf HD- Fernseher vorzustellen, jedoch in Form von HD-Filmen. Manche würden jetzt fragen, warum unbedingt Filme? Man kann Fotos ja auch direct auf HDTV zeigen! Ja, klar, dass man Fotos einfach in einem USB-Stick speichern und den USB-Anschluss hinter dem HDTV benutzen, um sie wiederzugeben. So schauen wir Fotos eins nach dem anderen an bis zum letzen. Was wäre es, falls es da hundert von Fotos gäbe? Ich schatze, dass die Zuschauer einschlafen würden. Aber was würde dann passieren, wenn man ein HD-Film mit Übergängen, Hintergrundmusik, Pan&Zoom-Effekten, Untertitel bzw. kurzem Text? Die Zuschauer verstehen die Fotos besser und sind die ganze Zeit über gespannt! Heute möchte ich euch beibringen, wie man seine digitalen Fotos in HD Filme auf Mac umwandeln und die gedrehten Filme auf HDTV wiedergeben kann. Dazu brauchen wir zuerst ein Programm namens HD Slideshow Maker für MAC, welches seinen Benutzern ermöglicht, lebhafte HD-Filme aus Fotos, Musik, Übergängen, Beschreibungen (Untertitel, kurzer Text), Pan&Zoom-Effekten, Hintergrundbild usw. auf Mac zu schnell und mit Leichtigkeit erstellen. Die kodierten HD-Filme kann man nachher direkt auf HDTV wiedergeben, oder direkt auf YouTube/Facebook hochladen. Jetzt schauen wir schrittweise, wie der Vorgang läuft, um einen HD-Film auf Mac mit HD Slideshow Maker zu erstellen. 1. HD Slideshow Maker auf Ihr Mac herunterladen. Programm installieren und starten. 2. Fotos aus der Festplatte auswählen und ins Programm hinzufügen. 3. Auf den „Add Music“ Button klicken, um geeignete Musik aus der Festplatte als Hintergrundmusik auszuwählen. 4. Auf „Theme“ klicken und über ein Thema/einen Motiv für den Film entscheiden. 5. Auf „Arrange“ klicken und die Reihenfolgen der Fotos umordnen. 6. Auf dem Würfel zwischen zwei Fotos klicken, um den Übergang neu zu stellen. Standardmäßig werden Übergangseffekte zufällig angewendet. 7. Klicken Sie auf jedes Foto in der Zeitleiste, um Texte hinzuzufügen und Pan & Zoom-Effekte zu setzen. 8. Auf den „Play“ Button klick und den Film vorschauen. 9. Klicken Sie auf den „Export“ Button, um das Projekt in HD-Film für HDTV zu kodieren. 10. Nachdem die Kodierung abgeschlossen ist, kopieren Sie das herausgegebene Video und speichern es auf einem USB-Stick. Dann verbinden Sie den USB-Stick über den USB-Port mit Ihrem HDTV. Jetzt setzen Sie sich, und / oder auch die Zuschauer vor den HD-Fernseher und den fantastischen HD-Film genießen, den Sie gerade selbst erstellt haben. Was ist HD Slideshow Maker und was kann man damit auf Mac erreichen? HD Slideshow Maker ist ein Foto-to-Video-Programm für Mac, welches seinen Benutzern dabei hilft, HD – Videos / Filme aus digitalen Fotos mit Musik, Übergängen, Motiven usw. in Minuten auf Mac zu erstellen. Sofort werden ihre Fotos ins Leben gebracht. Dieses Programm ist vor allem für die Wiedergabe von Fotos auf HDTV (Fernsehen mit hoher Auflösung) entwickelt. Die kodierten HD-Videos mit einer hohen Auflösung von 1920x1080p kann man entweder direkt auf HD-Fernseher abspielen, oder auf Facebook und YouTube hochladen. In einem Wort: HD Slideshow Maker macht es ihnen leicht, schöne Erinnerungen mit Familie und Freunden auf HD-Fernseher sowie via Internet zu teilen. 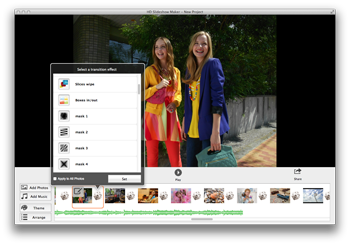 What is HD Slideshow Maker and what can we accomplish with this program on Mac? 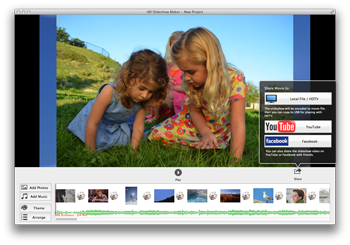 HD Slideshow Maker is a photo-to-video program for Mac that helps its users turn their digital photos into HD – videos/movies in minutes on Mac, with music, transitions, themes, etc. Immediately will these photos brought to life. This program is designed primarily for display of images on HDTV (high-definition television). The encoded HD videos with a high resolution of 1920×1080 can either be played directly on HDTV, or uploaded to Facebook and YouTube for share. In a word: HD Slideshow Maker makes it easy for its users to share memories with family and friends on HD television and via Internet.